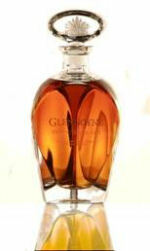 Dumgoyne, 19 May 2009: For the first time in its 175 year history, award-winning Glengoyne Distillery is to release its oldest, most valuable, and very best, Highland Single Malt: the Glengoyne 40 Years Old. The embodiment of Glengoyne’s famed unpeated and authentic ‘Real Taste of Malt’, the natural strength 40 Years Old Highland Single Malt is regarded by the distillery to be one of the finest whiskies they have ever produced. Its superior quality and flavour reflecting Glengoyne’s long standing commitment and enthusiasm for their craft and heritage. Every detail of the design and presentation of the Limited Edition Single Malt was carefully considered to reflect the outstanding character and craftsmanship of the Glengoyne 40 Years Old. Even the producer of the stunning hand blown crystal decanter, Glencairn Crystal, a well-respected independent Scottish family company, was specially selected for its shared values with Glengoyne. The shape of the crystal decanter creates a strong visual feature of the 40 Years Old Single Malt’s dark copper colour, complemented by gold engraving. Each decanter’s individual number, engraved in the base, is accompanied by an etching of Scotland’s most beautiful distillery, reflecting up through the malt itself. The 11 times lacquered piano-finished solid oak wood presentation box, complete with gold plates on the front and hand-stitched cream leather interior, further reinforces the excellent quality and showcases the rich, natural colour of the 40 Years Old Malt. An accompanying cream leather and gold foil traditionally bound book, personally signed by Distillery Manager, Robbie Hughes, provides tasting notes and detailed background on Glengoyne’s long and illustrious history as an independent distillery since 1833. With a nose of red apples, crème brulee and strawberries and cream, the Glengoyne 40 Years Old offers a complex and oily mouth feel of ripe bananas, spiced plums, honey and cereal, before drying into grapefruit and soft oak, with a long and lingering dry finish. “This is a world class, once in a lifetime bottling. It was essential that the design and presentation of the Glengoyne 40 Years Old Highland Single Malt be a true reflection of its outstanding quality and reinforce its position as one of the top luxury Limited Edition Single Malts available in the market today. The 40 Years Old Single Malt captures the pure essence of Glengoyne, from its heritage and craftsmanship through to its exceptional and unpeated ‘Real Taste of Malt’. It is a joy to open casks after four decades and find such great balance between malt and Still. It doesn’t get any better than this”. From August just 250 crystal decanters of this unique and treasured Malt from Glengoyne’s rare whisky reserves will be available from specialist whisky outlets in the UK and worldwide, Domestic RRP £3,750. Stylish diamond display plinths, designed to complement the bottle design and create maximum standout, will also be used to showcase the Glengoyne 40 Years Old in opinion-leading international luxury outlets. Glengoyne Highland Single Malt is one of the leading premium malt whiskies in the world and has been distilled at Glengoyne distillery since 1833. The 40 Years Old Highland Single Malt joins a multi gold award-winning range, which includes the Single Malt 10 Years Old, 12 Years Old Cask Strength, 17 Years Old and 21 Years Old, as well as a number of limited edition single casks released each year. Nose: Oily, red apples, crème brulee, ripe strawberries & cream. World class! Palate: Layers of ripe bananas, spiced plums, honey and cereal, dries into grapefruit, then soft oak. Complex. Oily mouth feel. It's a joy to open casks after four decades and find such great balance between Cask and Still. Finish: Long, dry and lingering.